Getting to the island paradise of Boracay can be hassle-free if you know how to do it right. 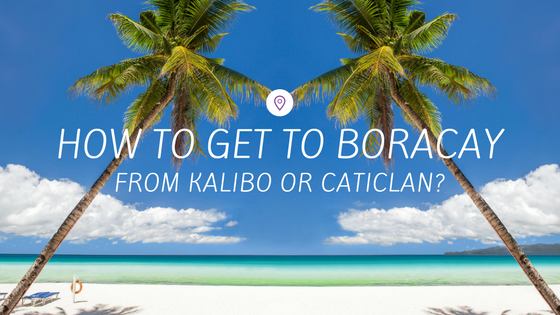 Here’s a step by step guide on how to get to Boracay island from the moment you land in Kalibo International Airport or Caticlan Airport. First, you need to choose which gateway you’ll fly in. You have two options – either you fly in Kalibo International Airport or Caticlan Airport. There are pros and cons and I’ll be pointing that out below. Kalibo airport is in the capital city of Aklan in the Visayas. It’s the bigger airport between the two and it can accommodate larger aircraft. Travel time from Kalibo Airport to Boracay island is approximately 2 hours. As you step out of Kalibo Airport, you will see a row of stalls where various tour operators offer different travel packages – bus or van ride to Caticlan Jetty and ferry across to Boracay. Be mindful of which tour operator you choose as some are sold by middle-men who tops up a fee to the original price. Your bus or van ride to Caticlan Jetty should approximately cost Php 200 for adults and Php 120 for kids. Caticlan airport is located in the northwestern tip of Aklan. Caticlan is a town in the main island of Panay that is closest to Boracay. The airport in Caticlan has a shorter runway (less than 1 kilometer), allowing only small planes to land. Aside from that, it also has a sunset limitation. All planes are not allowed to land and take-off in the evening. So if your flight is delayed from Manila and is set to land at 5:30 pm, chances are your flights will be diverted to Kalibo Airport. Nonetheless, Caticlan is closer to Boracay and if you want to enjoy more time in the island, this might be a better option. After you arrive in Caticlan Airport, you will need to take a short bus or van ride to Caticlan Jetty. This would approximately cost Php 150 for adults and Php 90 for kids. After an hour and a half bus/ van ride from Kalibo, you’ll reach Caticlan Jetty. All tourists coming in Boracay needs to pay a Terminal Fee of Php 100 and Environmental Fee (Php 75). If you are getting package transfer, this is usually covered in the fee and you will be whisk straight to the boat ride to Cagban Jetty. But if you are doing DIY tour, you need to settle all fees at the Tourist Registration Desk at Caticlan Jetty and fill in your personal details. Keep in mind that the operation hours of the boats are from 5 am to 10 pm daily. After a 15-minute boat ride, you’ll reach the shores of Boracay at Cagban Jetty. From here you can either take a tricycle (good for two to three passengers) or a small van to your resort. A tricycle ride would approximately cost Php 100 to any resort in station 1, 2 and 3. Phew! That seems a lot but not to worry, there is always an easy way to plan your travels to Boracay. Booking your transfers in advance can ensure you a smooth ride from the airport straight to your resort. In addition to that, you’ll cut the additional fees middle-men usually charge when you purchase your transfers outside the airport. Island Star Express provides a door-to-door transfer service from either Kalibo International Airport or Caticlan Airport straight to any resort in Boracay. You can book your transfers here or e-mail us at hello@islandstarexpress.com, we’ll be happy to help you! We look forward to seeing you in Boracay! Trust us, it is worth the journey!